“I believe that all bad, ugly and wrong that happened to me has made me the strong person I am today,” says Dr. Hemant who has lived his life cherishing sports, studies, business and family responsibilities, social work, and above all learning and growing from experiences. Each one has to face a time where our loved ones leave us, be it parents, friends or relatives. But then, we always have to stay strong and many times such situations make us really strong and here is the story of Dr. Hemant who turned into a responsible individual from a very self-centred one. He did his graduation from HL College Ahmedabad. 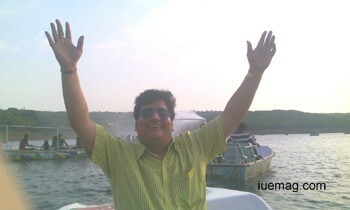 After which he did ICWA from HA College Ahmedabad followed by Ph.D. in naturopathy. But his interests and talents were mainly in sports - table tennis, badminton, cricket, volley ball to name a few. He served as the captain of under19 volleyball Ahmedabad team and represented his college in badminton up to university level. He has also played cricket till Ranji trophy Level. It was sports that built his foundation of being a good human being. “I believe that youth is not a time of life; it is a state of mind, a matter of will and vigour of the emotions. If one succeeds in this stage of life no one can stop them from being successful in life,” he says. His father had always been his inspiration, but unlike him, Dr. Hemant wanted to start with his manufacturing industry. But before he could step into fulfilling the dream of his own venture, unfortunately his father Mr. Baluram Gupta expired. At a mere age of 20, he had to take up the responsibility of his father entirely. “My whole world just got shattered,” says Dr Hemant feeling nostalgic. “We used to live in a joint family. But as time passed by, everyone separated just when I needed my family’s support the most. So I understood at a very young age that this world is full of betrayal and you need to be independent and strong enough to face them all. Thus this experience for sure shaped me strong, fearless, and independent,” narrates Dr Gupta who now helps people in living a life with support and positivity along with it, he is a successful businessman with his transport company in Ahmedabad, Gujarat. Yes, destiny rules and he was destined to do business of transport, but till date he hasn’t given up the hopes of living his dreams by constantly working for the foundation of manufacturing industry. But he also believes that transport business has made him learn many new things and this decision of destiny has proved to help him grow and work harder for his dreams. “I love that it has new challenges stored for each and every day. To me my business is like my baby. It has provided me personal growth, fame and money. My first election of transport, where I won with highest votes and got applauds from every member is one of my most memorable moments,” he smiles. On asking his views on spirituality he says, “Being spiritual is spreading the kindness - kindness towards yourself, towards others, towards animals, and towards this beautiful society that is our home. We should recognise that we all have the spark of love, that is, God within us, and learn to honour that love, so that you can know and experience the oneness of all that is. All we need to know is to be together for a happy tomorrow. Unity is strength” . Any facts, figures or references stated here are made by the author & don't reflect the endorsement of iU at all times unless otherwise drafted by official staff at iU. This article was first published here on 17th December 2014.